Hence, the Fed stressed again that it will remain patient for now. A more dovish Fed implies lower real interest rates and, thus, weaker tailwind for the US dollar.to appreciate. From the fundamental point of view, these factors should support the gold prices. However, investors should remember that one of the reasons why the US central bank softened its stance on monetary policy is subdued inflation. We are, of course, aware that the CPI rose 0.4 percent on March, but the core inflation rate declined from 2.1 to 2.0 percent on an annual basis. Gold bulls would definitely prefer a much stronger price pressure. As expected, the ECB kept the monetary policy parameters unchanged on Wednesday. However, Draghi noted that the recent data "confirms slower growth momentum extending into the current year". Indeed, the IMF sharply downgraded growth in the euro zone one day earlier. It now expects the bloc to grow at 1.3 percent in 2019 - compared to 1.6 percent forecasted six months ago. Moreover, the balance of risks remained negative, as the ECB President pointed out that "the risks surrounding the euro area growth outlook remain tilted to the downside." Hence, the ECB has been recently forced to backtrack its monetary tightening plans amid the global economic slowdown. It's likely now that Draghi will not deliver a single interest rate hike before his presidency ends later this year. A less hawkish ECB makes for a weaker euro against the US dollar, which should undermine gold's appeal. However, Mr. Draghi did not say anything revolutionary, so the impact on the precious metals market would be likely limited. 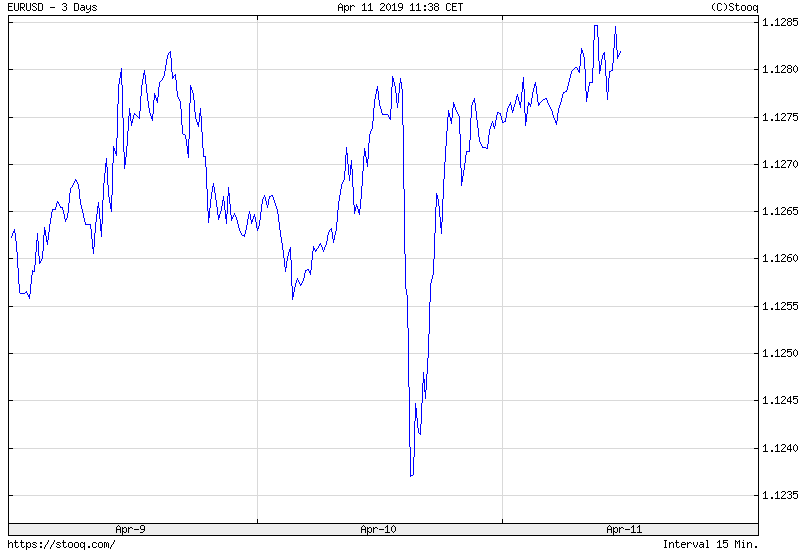 Indeed, the EUR/USD fell yesterday, but then it quickly rebounded, as the chart below shows.